In your career, you will probably have explored all manner of sales blogs, training courses, coaching sessions, boring mission statement meetings, tiring value proposition round tables and group Kumbaya conferences. You may even have been sober for some of them. This book is designed for people who want fresh, creative ideas to persuade corporate clients to choose their company rather than that idiot up the road. It’s also for people who are focused on what it takes to seriously win as opposed to taking themselves too seriously. 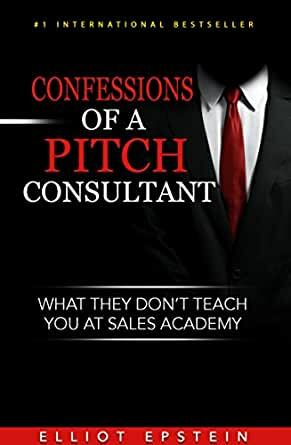 ‘Confessions of a Pitch Consultant’ is comprised of the most talked about articles I’ve published on my www.salientcommunication.com.au blog plus a few new, exclusive ones. So, if you are a Sales Manager, Sales Director, BDM, Account Manager, Relationship Manager, Pre- Sales Guru, Technical Sales Specialist, Solution Architect, Head of Sales, Superintendent of Customer Experience, then you have a lovely title. You might also enjoy the approaches in this book that have helped people win the unwinnable, keep their jobs, grow their careers, pay their mortgages and still have time to see their family because they don’t have to worry about achieving their budget. These are my confessions from consulting on thousands of sales engagements and pitches. Elliot Epstein, CEO Salient Communication is a leading Australian sales expert, pitch consultant and speaker helping clients win new business in highly competitive markets. He has coached and trained over 4500 people to differentiate, including CEOs, directors, successful sales teams, pre-sales gurus and corporate speakers throughout Australasia and Asia including Hong Kong and Singapore. Elliot is a dynamic, direct and humorous presenter having spoken at over 900 conferences, training workshops and break-out sessions for leading global companies such as HP, Computershare, SEEK, Hitachi, Toyota, EMC and Telstra. His no holds barred approach to creatively tackling issues that affect revenue performance, such as selling to large corporates and selling through Procurement have helped clients 'win the unwinnable' for over 15 years. Over the last few years, I have been privileged to have watched Elliot's public speaking events. I was completely mesmerized and recall wondering how one person could be so entertaining, yet humble and engaging which is exactly what is required to build solid business relationships. From there, our relationship has developed into a professional support role where he has assisted my business on many key pitches, and then into a caring mentoring role that has been invaluable personally in my career. For any business development professionals out there, or frankly for anyone in a senior position where your success is determined by your ability to communicate effectively and efficiently - THIS IS THE BOOK FOR YOU! An engaging and entertaining read that is sure to help you really make an impact - no matter what industry you're involved in. I use the skills and tools from Elliot's training everyday in my role. This book is a great read, and chock full of practical, real world stories. Guaranteed to make you laugh as you notice some of yourself, your boss, your clients, your competitors...gold! A quick read, with stacks of great insights in short easy to digest chunks. Worth tagging a few to read through again prior to important sales calls, networking events or in the preparation of those must win sales pitch / presentations. What every suit and creative should read. Must read for anyone who sells to corporate clients in competitive markets. Great stories!